Back in the early 60’s, Danish Modern furniture and décor was all the rage. 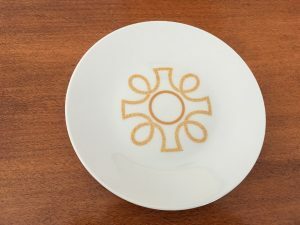 As engaged couples do, Niki and I chose a china pattern called Solar and put it on our wedding registry. A year after our marriage, the pattern was discontinued but we have continued to add pieces, usually finding them on Ebay. The combination of yellow and orange continued into our choice of furniture. After we moved into our current house, our color preferences changed. 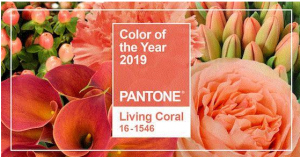 I am reminded of all this by the declaration of the Pantone Color of the Year for 2019 – Living Coral. In one way, it boggles my mind because so many of my clients declare that they love all colors except orange. However, when I query further, asking about softer shades such as peach, apricot, or salmon, I sometimes get a different answer. In another way, I understand the choice. Shades of orange can change a color scheme from ordinary to interesting or even exciting. This photo was taken in late May. The poppies will go dormant but the snaps and the Penstemon will continue to bloom throughout the summer and early fall. For instance, one of beds was initially shades of pink, blue, purple, and white. 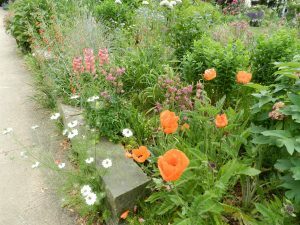 Once I added Papaver orientale ‘Pizzicato’, the color of orange sherbet, Penstemon barbatus with its strong orangey-red tubular blossoms, and ‘Twinny Peach’ snapdragons that are a pinky and peach bicolor, the bed became much more interesting. I also found that the softer shades of orange tempered the strong color of the Penstemon. To ensure that you are happy with adding orange to your garden, start with annuals such as dahlias, Impatiens, dwarf snaps, zinnias, or Lantana. 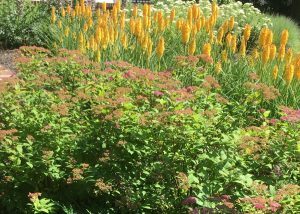 Assuming that you do like what shades of orange can do for your garden, then move on to perennials. 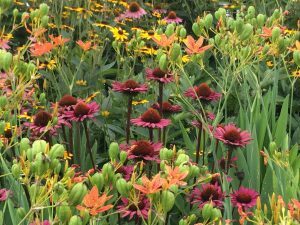 Last summer, when I attended a workshop at Inniswood Gardens in the Columbus area, one of the beds flaunted a vivid combination of Belamcanda chinensis (Blackberry Lily) and Echinacea ‘Merlot’. Orange and dusky rose are not commonly found together but the strength of the colors was tempered by the green seed pods of the lily plus a bit of a yellow-flowered daisy, probably one of the Rudbeckia. The orange in your garden can be perennial flowers such as Agastache, Lilium, Echinacea, or Phlox, just to name a few. 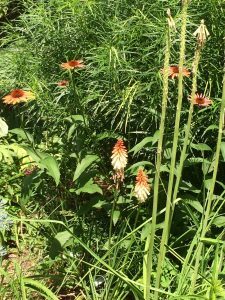 However, my favorites of the perennials are poppies, even though their bloom is fleeting, and Kniphofia (Poker Plant), particularly ‘Mango Popsicle’ and ‘Orange Vanilla Popsicle’. 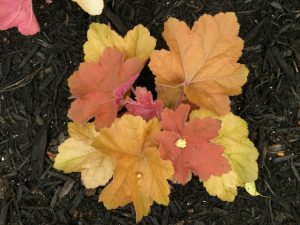 Color variation of Heuchera ‘Southern Comfort’ – taken in a client’s garden. Heucherella ‘Sweet Tea’ at end of March after overwintering in one of my containers. Don’t forget that you can introduce orange foliage into the garden. 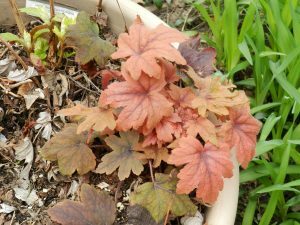 The easiest perennial for this purpose is Heuchera (Coral Bells) which will be happy in partial shade and even in sun as long as it receives sufficient moisture. ‘Caramel’ is golden orange; ‘Peach Flambé’ is bright peach in warm weather but becomes plummier in winter; ‘Southern Comfort’ varies between apricot, copper, and amber and has been one of standbys. Heucherella ‘Buttered Rum’ and ‘Sweet Tea’ will always need partial shade. The best annual for a wide selection of shades of orange is Coleus. One of my favorites has been ‘Sedona’. Give orange a try. I don’t think you’ll be sorry.